Where CW’s Flash and Arrow are enjoyable superhero romps, Daredevil showed what a comic book story could be like if given a budget beyond that of network television and virtually no limits when it came to grittiness. So how do you follow up a genre defining moment for comic book media? By upping the stakes, throwing in two high quality actors to portray new characters and taking Matt Murdock the furthest to the edge than he’s ever been. Season 2 of Daredevil in short is three stories/genres interwoven into one. The first being a gritty crime thriller, the second being closer to a courtroom drama and finally the third an action movie with a strong love story mixed in between. Normally such a mish-mash of ideas would boil over and create a highly convoluted mess and while the story does buckle at times it nonetheless pushes through for a satisfying story from start to finish. 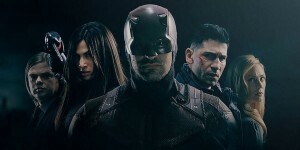 Season 2, without delving too deeply into any spoilers or major plot points, brings Matt Murdock aka Daredevil’s vigilantism into question asking viewers what separates him, if any, from just another vigilante trying to take justice into his own hands? What gives him the right to do that? Enter Frank Castle aka The Punisher played tremendously well by former Walking Dead star Jon Bernthal. For the Castle the only true way to rid the world of evil is to put a bullet in their head. For Murdock that is obviously not true justice but what is it that really sets him apart from Castle other than an itchy tricky finger? Bernthal plays Castle damn near perfectly, more than enough to wipe any lingering memory Punisher fans might have of the failed film franchises of the past. With his stone-cold demeanor, growling voice and dark tone, Bernthal perfectly plays a man on the edge of self-destruction but with the kind of hurt that could bring down even the strongest of us. It’ll be hard for many fans not to get at least a little misty-eyed toward the end of episode 4 of the season. But later on in the season we are introduced to yet another stunning performance this time in the form of French Cambodian actress Elodie Yung who plays Murdock’s assassin former lover Elektra. Much like how Bernthal washed away the stains of previous Punishers, Yung too removes the stink left behind by Jennifer Garner’s own portrayal in the 2003 film of Daredevil and replaces it with a truly unique and fascinating portrayal of the character. Yung plays a devilishly sadistic woman in Elektra and that is as dangerous as she is beautiful (and she is). But underneath that layer of crazy lies a very sympathetic character and as the season progresses Yung peels back these layers and gives the character a ton of depth. Her chemistry alongside Charlie Cox’s Matt Murdock, who again knocks it out of the park as this character, is flawless and it makes their characters’ often times psychotic romance both beautiful and unnerving. New things aside though, season two also improves upon some of season one’s short-comings. Relegated to mostly a comic relief and inconsequential side character role in season one, Eldon Henson’s Foggy Nelson does so much more in this season and has some great moments within the season showing true growth in the character. There is also no late season slump like season one. Where season one felt rushed to just get Cox in the Daredevil outfit at the end, season two is paced more or less perfectly from start to finish and really only suffers from a few too many events going on at once during the story. Season two isn’t without its shortcomings, of course. As mentioned the multitude of storylines at times makes the plot meatier than it should, creating a few convoluted moments that were hard to follow. Deborah Ann Wool as Karen Paige too continues to feel a bit underwritten and even gets a random romance shoehorned in with Murdock that feels out of place especially next to the more organic love story between him and Elektra. But these problems are overall inconsequential to the whole of what was a hell of a follow-up to the previous season and it’ll be hard to not see other fans not salivating for more at this season’s conclusion. Season two of Daredevil continues to push the envelope on what a comic-book show could be and if this and other Marvel programming on Netflix is any indication of the future we should all be excited for what comes next for The Devil of Hell’s Kitchen.